Yahoo! spoke with The Avengers writer/director Joss Whedon at the Iron Man 3 premiere last night and managed to get some good details about The Avengers 2 out of him. “I have finished a draft and I’m redoing it now. I think it’s in really good shape. We’re in a very good place,” he said. When they asked him if he felt pressure to top the first film, he offered this response. New characters you say? Whedon offered a few more details about who these might be. 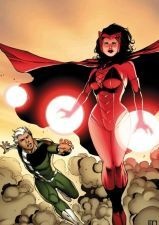 The only brother-sister combo that we can think of is Quicksilver and the Scarlet Witch. While Whedon could just be having fun at the expense of the online community, it is likely that these characters could appear in the sequel as Marvel shares the rights with Fox. Overall though, Whedon says he is having fun with the sequel. The subject of the upcoming Agents of S.H.I.E.L.D. series also came up. Check out the full video below and let us know what you think about these teases for The Avengers 2.